We’d love your help. 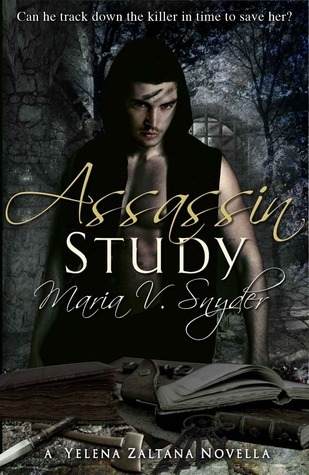 Let us know what’s wrong with this preview of Assassin Study by Maria V. Snyder. Yelena, the heroine of Maria V. Snyder's stunning debut novel Poison Study, is on her way to her ancestral homeland of Sitia to be reunited with her family and to learn more about her magical powers. An order of execution hangs over her head should she ever return to Ixia. 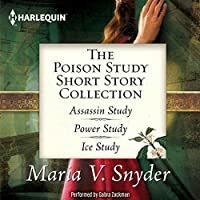 But her true love, Valek, quickly learns that an assassin has taken it upon himself to make sure Yele Yelena, the heroine of Maria V. Snyder's stunning debut novel Poison Study, is on her way to her ancestral homeland of Sitia to be reunited with her family and to learn more about her magical powers. An order of execution hangs over her head should she ever return to Ixia. But her true love, Valek, quickly learns that an assassin has taken it upon himself to make sure Yelena doesn't reach her destination. To ask other readers questions about Assassin Study, please sign up. Shima This isn't a book, It's a story and you can read it for free on the author's website. Just follow this link! What does book 1.5 mean? What order should I read the books in? Kylie Stoneburner 1.5 means that it's a short side story between main stories 1 & 2. This 1.5 is a short, 15 page, excursion of one of the main characters from the…more1.5 means that it's a short side story between main stories 1 & 2. This 1.5 is a short, 15 page, excursion of one of the main characters from the first book. The author's website has a sugessted order to read her collection of stories, including short stories and chapters from other characters' POV. This was very reminiscent of those ‘choose your own adventure’ books, which is probably simply due to the whole ‘letting the readers chose what happens next’ thing the author did. I will say that it’s a very bad idea to get on Valek’s bad side though! This was a short and sweet novella, and while it’s told from Valek’s point of view, it was a pretty unnecessary addition to this series. However, considering how obsessed I am with Valek at the moment, it didn’t really bother me all that much! This was way too short, but it has cemented my love for Valek and my absolute need for more of this series! I would’ve given this book page a lot less than 3 stars if it wasn’t 15 pages. Valek, the bae of all baes, is trying to catch up to an assassin who caught the order of assassinating Yelena, and is willing to kill her to be the commander’s second in command. A few bumps in the road, a new ally, and I guess that’s it…? I don’t even get why I’m writing a review on a novella that is 15 pages. Well, the basic reason was to explain why it got 3 stars not less. So guys read it just to waste time, I guess I would’ve given this book page a lot less than 3 stars if it wasn’t 15 pages. Valek, the bae of all baes, is trying to catch up to an assassin who caught the order of assassinating Yelena, and is willing to kill her to be the commander’s second in command. So guys read it just to waste time, I guess. This short story is fast and pretty entertaining. Must read for fans of Study series and to those who are in love *like me* with a certain assassin! Anyhoo, as someone who experiences occasional pangs of Poison Study withdrawal, I definitely had my fix with this novella. Assassin Study is a very quick read that takes place between Poison Study and Magic Study as Yelena travels to Sitia. While I thought the story was way too short (I need more Valek!! ), it was great to finally see the world through Valek's POV and witness his analyses. It was quite thrilling, especially when considering how ruthless he is when it comes to defending the people he loves most. It was also hot. This review has been hidden because it contains spoilers. To view it, click here. Valek goes after an assassin who's on his way to kill Yelena. He succeeds, easily. And that's about it. This is a short story that feels shorter than it actually is because there's very little character development and a straightforward plot that doesn't add to the overall narrative. You could skip this story and you wouldn't miss anything. Yelena has left Ixia to return home to her long-lost family and learn to control her magic, but someone’s taken her execution order and is determined to follow it through. Can Valek, master assassin, save the love of his life without revealing himself? I quite liked this story told from Valek’s point of view. I love his sense of duty and how he and Yelena have to separate for the betterment of each other. Valek’s quick and cunning, and this story was clearly written to be fan-influenced because at several points Snyder asks what Valek should do next – ie fight, surrender, trust someone – which I found really interesting, and I found the fan choices interesting as well. Snyder let her fans decide how Valek should react, and although I’m not sure I agree with all the choices he ‘made’, as some of them seem slightly out of character, Snyder is such a great writer that she managed to make it even the out of character choices work. There’s no lover’s reunion: Valek works from the shadows and doesn’t want Yelena distracted knowing he’s nearby. However I am interested to see how his choices made in this short story impact Magic Study. So good, this was the perfect pick me-up when I was having trouble sticking to a book that wasn't from this series. The second that I saw Maria V Snyder had a novella out it was on my kindle, and the second I realised it was from Valek’s POV my head snapped down and I was engrossed. I can’t get enough of Valek the Study Series and Assassin Study was bound to be a hit. The way that fans had voted on the outcome of the chapters was actually a great idea and I only wish I wasn’t too late to include myself in it. They also made the right decisions because some fans can know a character as well as the author does and therefore it all made perfect sense. Of course they can’t take all of the credit Maria V Synder did an amazing job, and she kept up a fast pace so you couldn’t take your eyes away and any interruptions would be followed with a murder, Valek style. But once again (I have the same problem with pretty much all novellas) IT WAS TOO SHORT! It ended abruptly when it could have gone on, but I think I still wouldn’t be happy with the length if it was a thousand pages. Anyway, Assassin Study is a must-read for all fans of the series, particularly if like me you can’t get enough of Valek. Apparently it was written in installments, and at the end of each section, Snyder gave her readers two choices for how things could go in the next section (b/c the endings were rather abrupt and cliffhanger-like). This was probably the best part, b/c of the two choices given, one would be the prudent, logical thing to do, and the other would be the who-the-hell-cares/guns-blazing option . . .
Every, single time the brash and go-forth-into-danger option was picked, and I thought it was hysterical. After all the 2-star reviews about this, i thought i might be sorely dissapointed after reading the novella, but it was fine. Yes, it was short and completely pointless to the plot but hey, it's about Valek and his POV!!! and because it's short it can't have an omg-its-so-good plot. i liked it. Nice little novella about Valek, which I appreciated a lot but didn't throughly love. There's no re Waste of time. If you read Poison Study isn't a bad book to read. If you don't read it fine, but it's great. 20 páginas de Valek siendo pura perfección. First time reading a 'choose-your-own-adventure' book. Kinda meh, and I'm not sure some of the choices the voters chose were in-character for Valek. This was so shooooort!!! Great small story though! I can't wait to finish Magic Study! Valek bu hikayede Yelena'nın bir kiralık katil tarafından takip edildiğini öğreniyor ve tüm işini gücünü bırakıp onun peşinden gidiyor. Gerçekten muhteşem bir adam, seksi birde. içim eriyor resmen. Assassin Study is a short novella from Valek's perspective that comes right after book one. Valek learns that there is an assassin hunting Yelena as she travels to Sitia. Valek won't stand for the danger his love is in. So he begins hunting the hunter, so the hunter becomes the hunted. I loved seeing from Valek's point of view!! It was quite beautiful to see how Yelena inspired positive change in him and the ways his love for her altered his persona! Quick and enjoyable read. I would def That was fun! A quick short story giving us a chance to see Valek in action. Readers got to weigh in while the story was being written with what they wanted to see happen next. Takes place just after Poison Study ends. The best bit about this book is having Valek on the cover. plot-line = killing spree. the end. 3.5 stars. Quick, short story. “Valek's thoughts returned to Yelena. An icy finger of loneliness touched the emptiness inside him. She was in Sitia, where she needed to be to learn aboout her magical powers, but she had taken his heart with her.